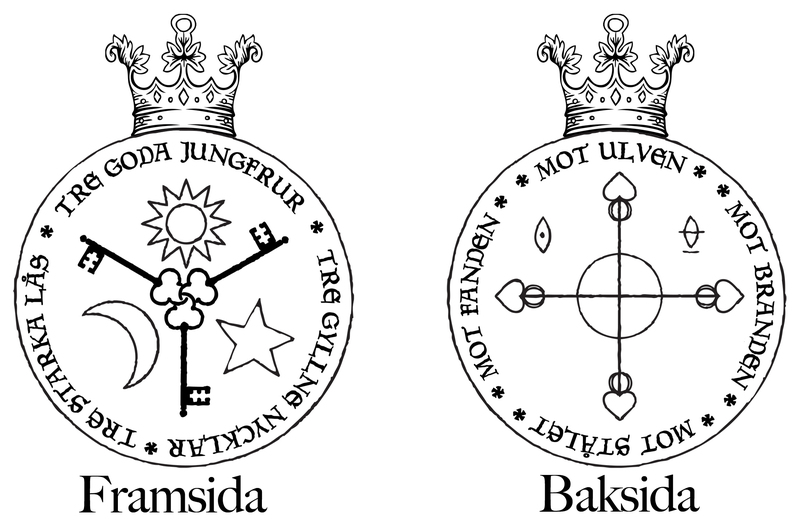 Ellakors (also known as älvkors – Fairy Cross) Is a round silver amulet with a cross and sometimes magical inscriptions. The cross is said to ward off evil energies and evil beings. The most magical crosses are made of silver inherited from nine different places and constructed on three consecutive Thursdays. Ellakors became popular during the 17th century and the are often engraved with magical words or blessings. Even today an Ellakors is a popular gift to newborn babies, presented at their baptism or name ceremony. One Ellakors was found in the soil in Lorenzburg and it seems to call three sacred maidens (the three Norns or unknown saints?) to assist against the wolf, fire, sharp steel and the devil. Next Next post: H.S.H. Prince Freï’s New Year’s speech 2016.